Often referred to as ‘the big ditch’ or ‘the bridge between two continents’ but if you take one look at the Panama Canal and you can’t help but think of the enormous amount of work that went in to it. With more than 10,000 men trying to excavate it a French company still went bankrupt trying to get the canal completed. The first person to even dream up the canal was Charles I back in 1534 the actual construction didn’t begin until 1882, the project came to a halt more than 7 years later with more than 22,000 people dead. In remain dormant for a couple of years until the United States took over the project in 1902 and eventually completed the canal. Here is the story behind the canal. When you come in from the Atlantic side you will first pass through a little over a mile of dredged channel and then there will be 2 mile before you hit the Gatun Locks. Huge ocean liners are lifted and pass through here, they rise more than 85 feet during the three sets of locks until finally reaching Gatun Lake. The damming of the Chagres River created Gatun Lake, put this together with the Gaillard Cut and it was an engineering marvel similar to digging a 10 foot deep trench from New York to California. 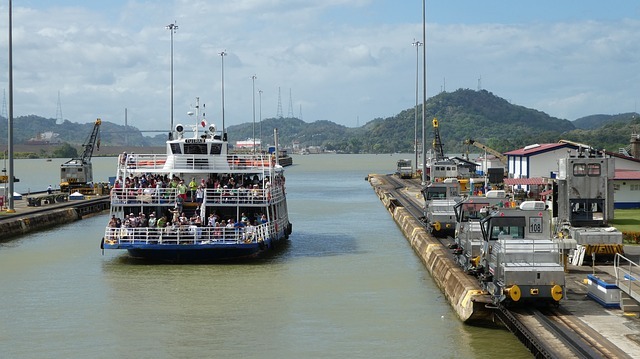 Once you pass through Gatun Lake and pass through another 2 miles of the canal and you will come to the Pedro Miguel Lock and here you will drop 31 feet. Here the lock borders Miraflores and you are still more than 50 feet above the level of the Pacific Ocean. The Miraflores Locks will eventually lower the ship until it reaches the Pacific Levels eventually reaching the Gulf of Panama. From the private balcony, you can watch the locks as you go from one to the other. You can watch one ship being lifted as another is being lowered. The lock system is 1,000 feet long and more than 100 feet wide. It can take up to 8 hours to go through the canal, but the view makes the whole trip worth it. Look at the lush rainforest, here you can watch the sun rise in the Atlantic and set in the Pacific. The Panama Canal is simply a marvel of modern engineering that allowed tourism and trade to go between the Atlantic and the Pacific. You need to experience it first hand to appreciate the work and the tragic history that went into it.